You just can’t call yourself a true-blue Arlington type until you’ve eaten at Mama’s. Delicious East Coast pies featuring a golden-browned, garlic butter-dusted crust have made this classic pizzeria a generational favorite for 50 years and counting. Not sure what to order first? Try Mama’s famous lunch buffet, where you can sample a bit of almost everything, or the Mama’s Supreme, which is pizza topped with Canadian bacon, pepperoni, black and green olives, green peppers, hamburger, sausage, onions, jalapeños and mushrooms. It seems like so many of the best pizza joints have that classic hole-in-the-wall vibe going on, and Joe’s Pizza is no exception. In addition to the Italian eatery’s friendly, old-school atmosphere, fans love Joe’s authentic New York pies and deep dish Sicilian pizza, as well as non-pizza offerings like the lobster ravioli, garlic knots, and spinach or pepperoni pinwheels. Mouth-watering pizza creations served with a healthy side of campus atmosphere are the headline attractions at Old School, but the popular downtown dining destination is also noted for a robust beer menu, daily specials, and late night hours. Worth trying: the bacon cheeseburger pizza (bacon, beef, onion, tomatoes and two kinds of cheese) or the Maverick Supreme (a yummy lineup of pepperoni, Canadian bacon, Italian sausage, green peppers, black olives, and mushrooms). Find cool things to do in Downtown Arlington after your pizza. East coast transplants who claim to know a thing or two about pizza say that Brooklyn’s is some of the best pie to be had in these parts. 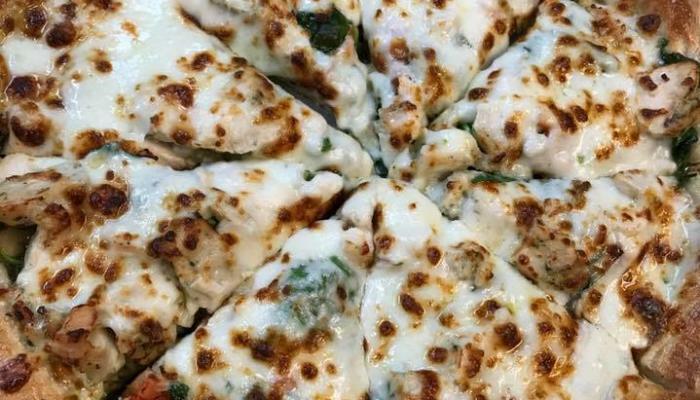 Fan favorites include the Alfredo pizza (creamy Alfredo sauce and mozzarella cheese), the fried mushrooms (try ‘em with a side of ranch dressing), and the stuffed pizza (sausage, hamburger, pepperoni and mozzarella and ricotta cheese). “Wherever you are, you should be here” greets website visitors searching for the nearest Blaze location, a sentiment with which the hip pizza chain’s legions of loyal fans would likely agree. Blaze specializes in artisanal-ingredient pies created in an assembly line setting, so if you like your pizza fast, hot, and good, you’ll definitely want to add Blaze to your Arlington pizza to-do list. One of our favorites is the barbecue chicken pizza, which stars grilled chicken, mozzarella, red onion, banana peppers and gorgonzola, all topped with a barbecue sauce drizzle.